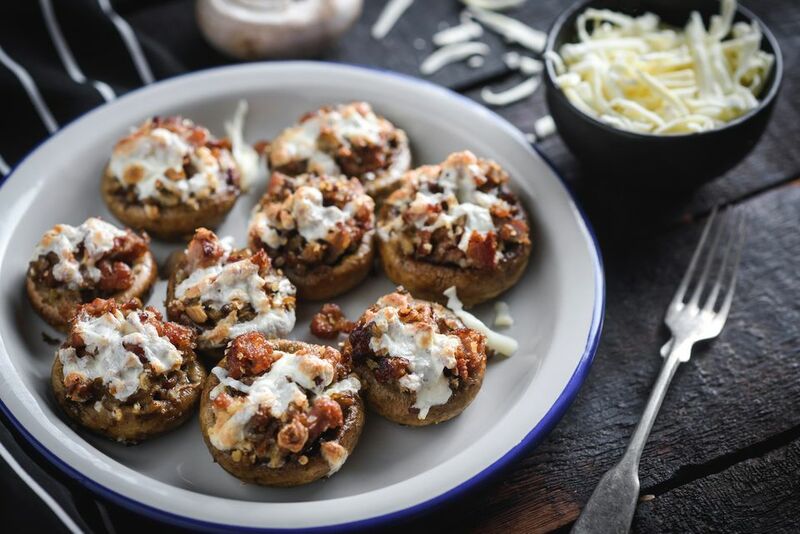 These sausage stuffed mushrooms are simple and tasty, and they make a fabulous appetizer. The sausage stuffing is baked in the mushroom caps. Top them with more shredded mozzarella cheese if you like. It's a simple recipe with only four ingredients, but feel free to add some finely chopped onion or green onion to the stuffing. Put the sausage in a skillet over medium heat. Cook the sausage, stirring and breaking up until it is fully cooked. Remove the sausage to a bowl, leaving 1 or 2 tablespoons of drippings in the skillet. Cook the mushroom stems in the drippings for 5 to 10 minutes, until tender and browned. Remove the pan from the heat. Stir the cooked mushroom pieces into the bowl with the sausage. Add the bread crumbs and cheese; blend thoroughly. Fill mushroom caps with the sausage mixture. If desired, top the stuffed mushrooms with more mozzarella cheese and return to the oven just until the cheese has melted. Add a few tablespoons of finely minced onion to the skillet and sauté along with the sausage. Add a tablespoon or two of finely minced bell pepper to the skillet with the sausage.